Mathematics and Dutch language, spelling, grammar, reading and writing skills are the most formal element and come from the Wereldschool. The Wereldschool is a program for remote learning. 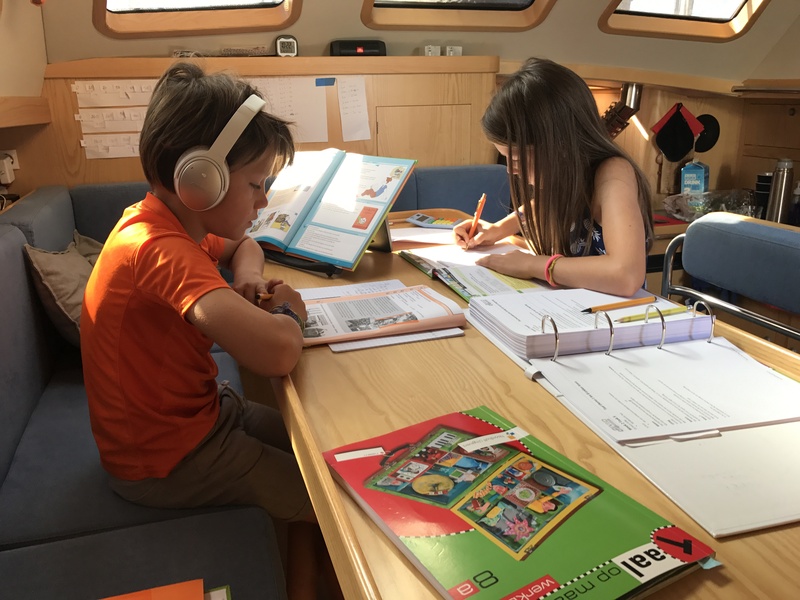 We received from them a detailed teaching package, day-to-day lesson materials and we have a teacher in the Netherlands supporting us for all subjects and monitoring Emma and Macsen’s progress. We send in bi-weekly assignments for her to correct and there is a monthly test. In addition, the monkies will continue to take part in the formal standardised testing in the Netherlands. ‘Juf Mama’ leads the mathematics and ‘Meester Papa’ leads the Dutch language related learning. The monkies have not yet selected a preferred teacher and we do not encourage them to show any preference. We spend 15-20 hours per week on these topics. To add to the structural part of our schooling we are also working on formalizing and developing English language skills using the Harper Collins Primary English materials. Geography, culture, history, foreign languages are natural focal points of our travels and we make a strong point of ensuring that we spend a great deal of time looking at maps (because maps are cool), planning navigation (because this is necessary and because maps are cool), discussing the similarities and differences of each new port of call, learning about the background and history of each new place and talking to people. Sport comes in many forms. Sailing (also physics), hiking (also includes biology, geology), swimming and snorkelling (also marine biology), SUPping, running, rollerblading, scootering, boot camp with Mama, frisbee and ball sports and many many other things. Science also comes in many forms. We are working with Indigo Expeditions to collect samples of sea water to send in for water quality analysis. This is a very sensitive process and must be done perfectly as the analysis of each samples costs over $1000! We also have made a secchi disk to measure the visibility through the water. We have a plankton net to capture plankton to view through our microsope. We are enjoying looking at very small things through our microscope, it is mesmerizing. The monkies have become highly proficient at identifying objects for viewing and learning to focus effectively on key areas. We have seen some amazing up close fish scales, sea salt particles, human skin, onion skin, fish eyes, fly wings and head lice to name a few. They label these materials and add them to their collection. The little louse was the most amazing, looking like a huge monster on the screen. Music enters our lives daily. We sing and dance a lot, are attempting to play guitar and harmonica, the monkies are developing synchronised dances and the coast of Spain and Portugal has been rather full of small concerts and events and we have enjoyed these as well. And really, these are just some of the more formal elements that we have identified. We are all learning so much just moving, traveling and living together as we go. Whew, that seems like a well structured and highly responsible list. I do I believe it is a good plan and I am very excited about this new process. But it’s not easy. Some days I feel like a super parent, incredibly connected to my monkies in this wonderous way as I see their eyes light up with the joy of learning or we figure something complicated out together. And some days I want to cry in the corner (and sometimes I do) because its not working, they are rebelling, neither of us understands, I’m not sure I am capable of offering enough, there simply is not enough time and I’m angry and frustrated and don’t know how much of that I can responsibly let them see. We are preparing ourselves as well as we can for the monkies to enter a new schooling system in Canada and we have little insight at the moment as to what the new requirements will be. And there are many days when it’s OK but we would all rather be outside playing. You guys are super fortunate to spend the time together, please don’t let a few setbacks or tantrums get in the way of that and do enjoy the time before to go all teenager on you…. What your kids are experiencing thanks to you taking them on this adventure cannot and will not be learned in any school, and yet, they will be the most valuable skills they acquire! I loved reading about the ‘by-products’ (for lack of a better word) of the discipline, the joy of discovery together, the microscope and what it gets you all to see, the dancing (guitar? Wow!) — if some of the formal stuff doesn’t work I’m sure all of it together is making you very fortunate, and you have chosen it. Long ago I read that happiness is not a goal, it is a by-product. I guess one of many. What an adventure! And so cool to read about it! Good luck with all the struggles, and enjoy all the joyful moments! We’ll keep on following you guys!